NETWORK FINALS: NBC’s NFL PLAYOFFS game adjusted to 7.0 in final numbers. Elsewhere, the reruns of THE GOOD DOCTOR and THE FOUR each dropped 0.1. CABLE HIGHLIGHTS: ESPN’s afternoon NFL PLAYOFFS game (which it shared with ABC) took the cable day at 1.98, sandwiched by COLLEGE BASKETBALL games at 0.39/0.36. 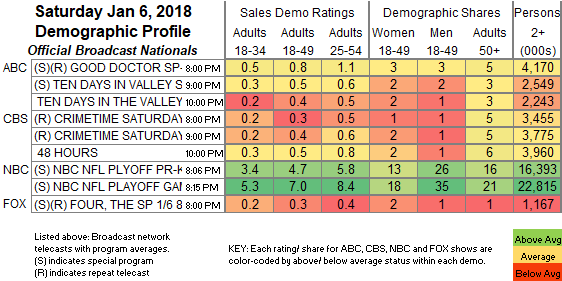 A&E’s LIVE PD led non-sports at 0.62. Adult Swim’s late-night line-up returned as follows: DRAGON BALL at 0.46/0.40, BLACK CLOVER at 0.31, JOJO’S ADVENTURES at 0.27, MOBILE SUIT GUNDAM at 0.23, HUNTER X HUNTER at 0.21/454K, LUPIN THE 3RD at 0.20, NARUTO at 0.18/384K, OUTLAW STAR at 0.17/386K, COWBOY BEBOP at 0.19/407K, and GHOST IN THE SHELL at 0.19/401K. Hallmark’s movie LOVE ON THE SLOPES was at 0.35, and Lifetime’s movie A TALE OF TWO COREYS was at 0.29, with a lead-out special also at 0.29. A non-CFP COLLEGE FOOTBALL game on ESPN2 was at 0.33. 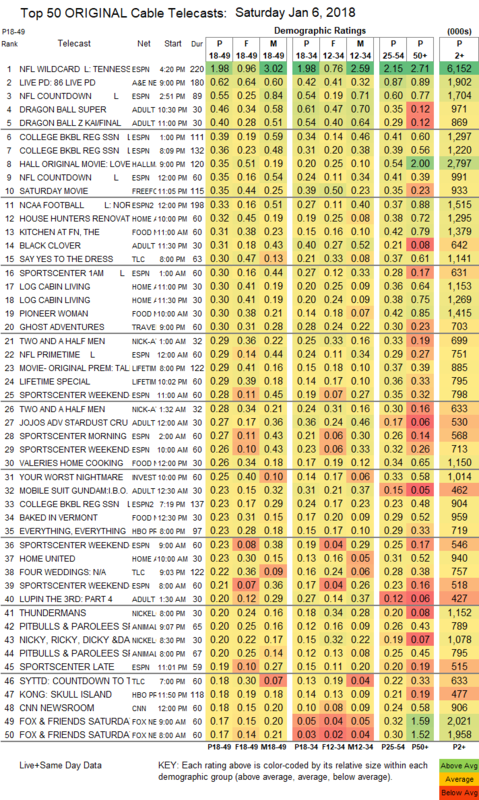 On HGTV, HOUSE HUNTERS RENOVATION returned at 0.32, and a pair of late-night LOG CABIN LIVING episodes were at 0.30/0.30. On Food Network, KITCHEN AT FN rose 0.02 to 0.31, PIONEER WOMAN ticked up to 0.30, VALERIE’S HOME COOKING was at 0.26, and BAKED IN VERMONT was up 0.04 to 0.23. TLC’s SAY YES TO THE DRESS was at 0.30, with lead-out FOUR WEDDINGS at 0.22. Travel Channel’s GHOST ADVENTURES was at 0.30. ID’s YOUR WORST NIGHTMARES dipped 0.02 to 0.25. On OWN, WELCOME TO SWEETIE PIE’S was at 0.13. On USA, FALLING WATER had an inauspicious Season 2 premiere at 0.09.